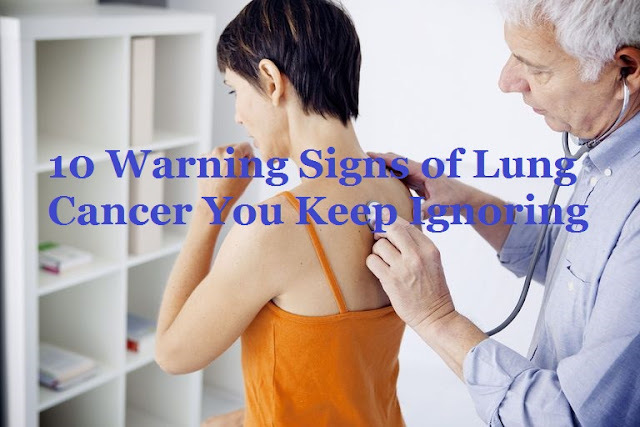 Lung cancer warning signs may be obvious, or they may be subtle enough that they aren’t immediately thought of as a cause for concern. Since at least half of people diagnosed with lung cancer are already in the advanced stages of the disease, recognizing the warning signs is important if we want to make a difference in the survival rate. What are 10 lung cancer warning signs that you should never ignore? One of the most common signs of lung cancer is a persistent cough. It may seem obvious that this symptom should be checked out, but it is often attributed to something else. Perhaps you think it is allergies or just another winter cold, or that if you just wait another week it will go away. If you smoke, maybe you just consider it a smoker's cough. Even if it seems like there is a simple reason for your chronic cough, if it's lasting, get it checked out. Here are some causes of a persistent cough. Coughing up blood--even a small amount--is never normal. There are many conditions that can cause you to cough up blood, and one of these is lung cancer. In fact, 7 percent of the time it is the only symptom of lung cancer. Learn more about the causes and evaluation of coughing up blood. Many people who have been diagnosed with lung cancer said that they had become increasingly short of breath. Often, however, this isn’t usually a dramatic change.You might think your shortness of breath is occurring because you are a few years older, or you might attribute that decreased ability to run up the stairs without catching your breath as a sign that you need to exercise more. Talk to your doctor if you feel short of breath for any reason. What might it mean if you are short of breath? When a cancer is present in your lungs, it can obstruct your airways, predisposing you to lung infections such as pneumonia and bronchitis. One problem is that even though lung cancer can cause pneumonia, it's much harder to diagnose when a lung infection is present. Changes on x-rays caused by pneumonia can make it very difficult to see a cancer in some cases. If you have recurrent lung infections, ask your doctor if you need to be checked out further as to the cause of your infections. Certainly, symptoms of pain in your chest or back are more likely to be related to a cause other than lung cancer. Most of us have had back pain after lifting something we probably shouldn’t have. But pain that persists, especially if you can’t think of any reason for that pain, should prompt a call to your doctor. Chest pain related to lung cancer tends to be constant rather than intermittent, and may worsen with time. Learn more about back pain as a symptom of lung cancer, and the possible causes of lung pain. When lung cancers grow near the top of the lungs (Pancoast tumors), they can put pressure on nerves in the armpit. This can cause shoulder pain that sometimes travels down the inside of the arm down to the hands. When is shoulder pain a symptom of lung cancer? I know this is a tough one. Do you know of anyone in your life that hasn’t complained about being tired at times? Yet the fatigue that goes along with cancer is often different. It is a tiredness that you can’t seem to “push through” or override with a cup of coffee. If you feel tired even though your lifestyle doesn’t explain the fatigue, especially if you feel tired after a good night’s rest, talk with your doctor. A hoarse voice can occur with lung cancer if the tumor places pressure near your voice box (larynx) or irritates nerves traveling to the voice box.You may first notice that you need to “clear your throat” more often, or a friend or family member may remark that your voice sounds different than usual. Hoarseness can occur with allergies as a remnant of a cold, or even from singing too loud in the car or cheering too loud at a ball game. But if you notice hoarseness that lasts, get it checked out. In a society where being overweight is the norm, this symptom may actually be welcomed at first – especially if the pounds drop off without eating less or exercising more. But unintentional weight loss should always be evaluated. Cancers can cause changes in your metabolism so that weight loss occurs even if you eat the proper amount of calories. Lung cancer has presented in many uncommon ways, ranging from anemia to diarrhea to knee pain. Some lung cancers release hormone-like substances causing a unique constellation of symptoms termed paraneoplastic syndrome. Given that lung cancer is the leading cause of cancer deaths for both men and women in the United States, these uncommon symptoms are not so uncommon when they add up as initial signs of lung cancer. If you don’t have a good explanation for something that is concerning to you, ask your doctor. And if she can’t give you a solid explanation, ask her who she would recommend you talk with. If you have smoked an average of 30 pack-years, are between the ages of 55 and 80, and continue to smoke or have quit in the past 15 years, talk to your doctor about CT screening for lung cancer. Lung cancer is most curable when it is caught in the early stages of the disease. As a final note, don't hesitate to talk to your doctor if you have any of these symptoms - or if you have any symptoms not on this list. Lung cancer is the leading cause of cancer deaths for both men and women in the United States, and lung cancer is the 6th leading cause of cancer deaths in never smokers. If you are a never smoker with these symptoms, get a second opinion if needed. It's been found that non-smokers are often diagnosed in the more advanced stages of the disease - because the diagnosis is low on many doctor's radar screens. If you are a smoker, don't hesitate to call your doctor. A 2016 study found that people who smoke are less likely to visit their doctors with warning signs of lung cancer than non-smokers. If you feel guilty about smoking, erase that guilt and make the appointment. Everyone - whether someone has never smoked or has chain smoked throughout life - deserves the best of care and treatment in facing lung cancer. Friedemann, S., Whitaker, K., Winstanley, K., and J. Wardle. Smokers are less likely than non-smokers to seek help for a lung cancer 'alarm' symptom. Thorax. 2016 Feb 24. (Epub ahead of print). This post was republished from verywell.com. You can find the original post here.